In time-travel stories, it’s common for characters to meet their former selves. I guess it was only a matter of time before Legends of Tomorrow played with a paradox, but I didn’t think it would happen this soon. I don’t expect this show to be too graceful, but it appears to handle its central theme — destiny — in wildly contradictory ways. On the one hand, Professor Stein meets his 1975 self after the team’s first confrontation with Vandal Savage fails spectacularly. (Putting a small piece of the Atom’s suit in Savage’s hands.) The dynamic between Professor Stein and his younger self suggests that fate isn’t fixed and history can be changed, which Sara alluded to toward the end of the first episode. On the other hand, Hawkman and Hawkgirl treat destiny as an immutable fact that should be embraced. So, which is it? Can these characters change their destinies, or are their fates sealed? The main plot for our newly formed ragtag group, still in 1975, involves two attempts to capture Vandal Savage. The first involves Professor Stein, Leonard, Mick, and Sara conning their way into an arms deal, where Arrow’s Damien Darhk makes a cameo appearance. The second plan involves Leonard, Mick, and Ray (who has an uncanny ability to tag along uninvited) sneaking into the home of a millionaire to swipe an ancient blade, which Kendra recognized from a newspaper clipping as a weapon that can kill Savage. Got all that? These narratives are intermittently interesting. The large-scale fight scene that unfurls at the arm’s deal is definitely expansive, full of sound and fury — but it feels more messy than epic. The fallout from these failures, however, is when things get good. When Professor Stein isn’t able to get the technology from a suspicious Young Stein, Sara hits him over the head with his bong and they move on. They’re able to recover the Atom’s suit piece from Savage’s scientist. But the timeline still isn’t safe: Professor Stein notices his wedding ring fading in and out of existence. Younger Stein is supposed to meet his future wife that evening, so he either didn’t wake up or decided to forgo the party altogether. As they head back to the time ship, it becomes clear it’s the latter: How did nobody notice Younger Stein following them? Professor Stein patches things up with his younger self without fully explaining who he is or what is going on, repairing both the timeline and his marriage. The scenes between Professor Stein and his younger self bring up interesting questions about identity and self-perception, but I never really believed Professor Stein was all that arrogant before this episode. Leonard, Mick, and Ray’s mission fares much worse. Ray may be smart, but he’s got the emotional intelligence of a walnut. He ignores Leonard or Mick, who have a ton of experience with burglary, and accidentally trips the home’s dummy alarm. We do get a touching moment between Leonard and Ray, which develops some of the tension we saw on The Flash. The show is obviously gearing up to a point where Leonard becomes a hero, or at least acts more openly as an antihero. But Ray’s presence still doesn’t make sense. The only reason he’s in the scene is because the plot requires him to be there. 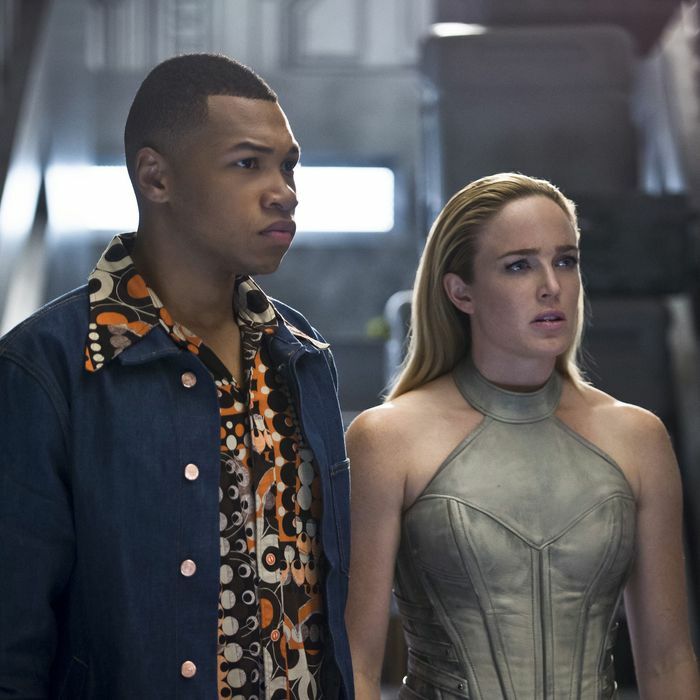 The episode’s plotting betrays the biggest issue with Legends of Tomorrow: These characters don’t feel like a team yet. When they interact, it feels jarring. The trio of Leonard, Mick, and Ray actually gets to the ancient blade, but their victory is short-lived. The owner of the mansion appears — and it’s Vandal Savage. The whole team arrives to take down Savage, but the plan mostly relies on Kendra and Carter. Carter stabs Savage with the ancient blade, but surprise, surprise! It doesn’t kill him. Then, Savage turns the weapon on Carter, killing Carter. Apparently, only Kendra can properly wield the blade and kill Savage with it. Considering that Carter has been positioned as someone far more familiar with their past lives than Kendra, this is an interesting development. Why didn’t he recognize the blade in Dr. Beardman’s newspaper clipping? Why didn’t he know that the blade could only be wielded by Kendra? When will this show stop with the cheesy Ancient Egypt flashbacks? Carter dies, and I couldn’t be happier. What I’m not happy about, though, is Kendra’s inept behavior as Hawkgirl. She charges at Savage, but apparently lacks the skills to land a single blow. Savage easily subdues her. Proving himself to be a Nice Guy whose grossness spans centuries, he tells her he loves her, then stabs her. Sure. The team saves Kendra when they bring her back to the ship, but they still end up worse off than they began. Carter is dead. Savage is stronger. And, on top of all that, he knows they’re time travelers. Great job, everyone. Nevertheless, the episode ends with the heroes more bonded than ever. “For Carter!” they all exclaim. The camaraderie feels empty to me, since we didn’t get to know Carter too well — and what we did learn hadn’t really endeared him to us. He vacillated between undercutting Kendra and acting like a blowhard. He tried to force Kendra to adopt the personality of her past self. When she’s on the verge of saying she does indeed love him, it feels unearned. Which brings us back to the show’s major contradiction: We’re supposed to believe that these not-quite heroes can create their own destiny, but Kendra has no choice but to accept her fate as Hawkgirl and her relationship with Carter. Thanks to reincarnation and time travel, Carter will most definitely come back. However, the length of his absence will tell us a lot about this show’s appetite for risk. Maybe this is supposed to embody what Rip Hunter says earlier in the episode: “Time changes. People don’t.” I just wish Kendra were allowed to choose. What if her and Carter aren’t meant to be together? The relationship doesn’t feel healthy and they lack chemistry. Legends of Tomorrow has a lot of potential, but the writers don’t seem to know what to do with it yet. The premise is zany enough to draw attention. The characters and casting are generally good, despite the ones that fall flat. But so far, the show is too unfocused. It flies in so many directions, which frustrates me more than anything else. Still, there’s a lot of charm here and enough good ideas, so I’m hopeful that it will rebound from a lackluster start. Like The Flash and Arrow, Legends of Tomorrow is a thoroughly middlebrow show. That doesn’t mean it shouldn’t be well-crafted.